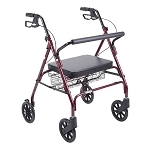 Roscoe Transport Rollator, Burgundy • Large 8” wheels with wheel locks • Fold down footrests make transporting a patient easy • Locking, easy-to-use loop style brakes • Padded seat with easy-folding system • Curved padded backrest with push handle • Weight Capacity: 250 lbs. 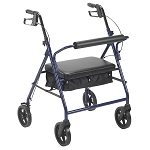 The Transport Rollator provides patients with the security of a wheeled rollator combined with the convenience of a companion transport chair for short trips. 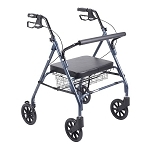 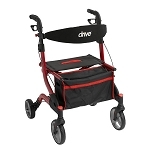 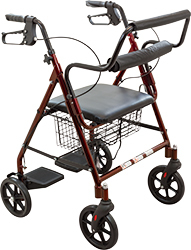 Equipped with flip-up footrests, an individual can be pushed safely by a care giver.The large 8” casters provide a smooth ride making it perfect for indoor and outdoor use.The rollator’s handles adjust to the user’s height while the reliable, loop style brakes control speed and lock wheels when seated.A limited lifetime warranty comes standard.